Director Kenji Mizoguchi draws audiences closer by keeping them at a distance. The camera in “The Story of the Last Chrysanthemum” (1939) certainly maintains a discreet distance, often in long master shots that frame the actors' bodies as small elements within their environment even over the course of a lengthy intimate conversation. In one repeated set-up, the budding lovers Kikunosuke (played by esteemed stage actor Shotaro Hanayagi) and Otoku (Kakuko Mori) talk while strolling along a wharf. Shot from below, their heads barely reach halfway up the frame, with rooftops and the blank night sky (in a studio, I presume) filling out the rest of the image. Though their faces are visible at times, Mizoguchi never cuts into a close-up (or cuts at all), and the scenes derive their power not from facial expressions, but rather from the posture and movements of the actors and a raoming camera that relentlessly tracks alongside, but never too close to them. The camera assumes many vantage points throughout the movie, filming performers from below, at diagonal or perpendicular angles, and even in clinical overhead shots, but close-ups are deployed sparingly. In part, this is because Mizoguchi was inspired by both kabuki and shinpa theater, but I also feel like he simply trusted the power of the meticulously composed image over the blunt force of teary-eyed pathos. Though his films feature suffering protagonists, especially women (mothers, sisters, wives) who sacrifice everything for the men they love, his films grant viewers space to breathe and react rather than grabbing them by the collar and commanding them to wallow in close-up misery. Mizoguchi encourages, even requires, an active viewer who doesn't need to be guided every step of the way. As usual, the great David Bordwell puts it most succinctly, “Mizoguchi refuses to beg for tears.” But he sure generates them. Based on writer Shofu Muramatsu's story, the film opens in 1880's Tokyo with a kabuki play starring the great Kikugoro (Gonjuro Kawarazaki) and his not-so-great son Kikunosuke (usually called Kiku), both real historical figures. While various hangers-on mock Kiku's performance behind his back, they fawn in person over the young master who wastes his days out drinking with his sycophantic entourage and consorting with opportunistic geisha. Only the pure and innocent Otoku, nursemaid to Kiku's infant brother, dares to tell the dilettantish fop that he stinks on ice, but she does so in hopes of inspiring him to commit to his art and become as great as his father, as great as she sincerely believes Kiku can be. Kiku's prestigious family does not approve of the working-class Otoku and dismisses her when the relationship comes to light. Risking permanent ostracism from his family, Kiku runs away to pursue both Otoku and his craft, a perilous apprenticeship requiring five years of poverty and unhappiness before Kiku can emerge as a better actor. Kiku falls off the acting wagon several times, settling for mediocrity and indulging in self pity, a bracing reminder that it's easy to vow to dedicate yourself to a cause, far more challenging to decide each day to stick to that vow. As is typical in Mizoguchi films (and the shinpa tradition that influenced him), the woman exists primarily to support the man, and noble Otoku never asks for anything in return, fulfilled simply by serving as Kiku's muse. She even encourages her husband to abandon her when Kiku has a chance to stage a heroic comeback on stage in a magnificent, prolonged set piece in which Mizoguchi showcases kabuki theater in all its glory. The viewer who took note of Otoku's persistent cough about halfway through the movie won't be surprised that she is not destined for the same glory, meeting the same fate that awaits most Mizoguchi heroines. Are we nonetheless intended to view the closing scenes as mutual triumphs for protagonists who achieve their respective goals? Mizoguchi doesn't tie a ribbon on it. 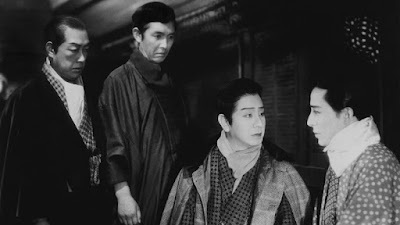 Though the final kabuki performance, with Kiku wowing audiences in a challenging female role, features a few strategic close-ups and traditional continuity editing, the camera keeps hanging stubbornly back through most of the film, and long takes roll on uninterrupted, sometimes for a few minutes or more. 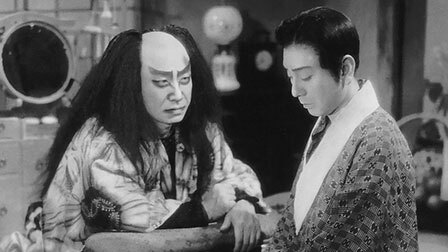 These stylistic choices forge a detached perspective that eschews easy judgment of the sometimes petulant Kiku and the passive Otoku, and thus invites a deeper level of compassion, one of the defining hallmarks of Mizoguchi's extraordinary career, about half of which has been lost to the vagaries of film preservation. Thank goodness this fragile flower survived. The film is presented in its original 1.37:1 aspect ratio. Considering that many Mizoguchi films from this period or earlier didn't survive at all, it's not a surprise that the source material has some issues. According to Criterion, the restoration was sourced from “a 35 mm fine-grain positive and a 35 mm duplicate negative” so it's possible the original negative no longer survives, and with multiple sources, the image quality inevitably varies. This 4K digital restoration provides a major improvement over most earlier available versions of the film, but the image is soft in many scenes and it's just not possible to achieve the same sharp detail we've become accustomed to in 1080p. The black-and-white contrast is somewhat muted too. However, the overall image is as perfectly fine and likely as good as it's going to get without artificial boosting that wipes out too much of the original information. The audio is linear PCM Mono and it's a bit warbly and occasionally drops out, but that's a product of the audio source. Optional English subtitles support the Japanese audio. The only extra on the disc is a June 2016 interview with film critic Phillip Lopate which covers a lot of ground in a short time. I took almost a full page of notes. I'll just list one. Lopate says there are only 140 shots in the entire 143-minute film and some advanced math indicates that tallies up to an average shot length (ASL) of about one minute. Not a record holder, but a world of difference from the modern blockbuster with its average ASL in the 2-3 second range. The slim foldout booklet includes an essay by scholar Dudley Andrew. 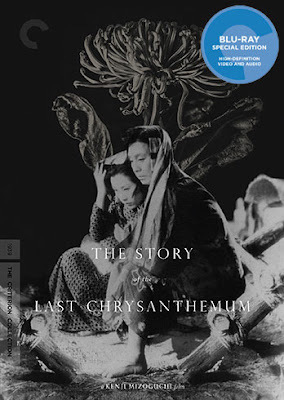 “The Story Of the Last Chrysanthemum” is the latest addition to their Mizoguchi collection, and if we're spoiled enough to wish Criterion could have found more extras to include, let's not take for granted that we know have a fine high-def version of perhaps the first truly great Mizogushi film. Although it should be noted that he had already shout about fifty films by then.